If we agree that Knowledge Management is 80% about people and 20% about technology, how are we planning on managing the people from a knowledge perspective. What do we know about how people share (or don't share) their knowledge within organizations? What are the individual (personality) factors and organizational factors that come into play to determine who shares with whom, what is being shared and how it is being shared? One way to look at these issues is to think of organizations as social networks rather than organization charts. This book is part of a relatively small social network analysis (SNA) school of thought within the broader KM landscape. "Most leaders are desperately seeking ways to get greater results from their organizations. 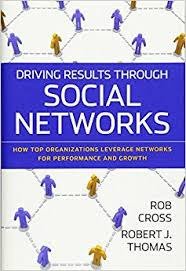 While they are quick to acknowledge the value and power of informal networks for getting work done, far too often leaders apply flawed approaches to generating business results from networks. What they need is a proven method for assessing and managing networks for strategic purposes. SNA has a place in any organization-wide KM strategy development and implementation. Perhaps 50% of the benefits of SNA can be gained from a very basic understanding of the concepts. The folks who are SNA subject matter experts would disagree with me. I'm a little skeptical about significant investments in SNA without a broader KM strategy. I'd like to see SNA-on-a-shoestring approaches, activity-based approaches that can be used with groups within organizations to immediately get people to recognize their own patterns of interactions and how they may be reinforcing silos. In other words, I like activities that can bring immediate action and I'm skeptical of SNA studies that are going to require months of analysis and complex results. At the end of 2017, look at the evolution of my social (professional) network during the year. How did my network increase? What weak and strong connections did I make? How did I primarily connect with people? What approaches worked best? What could I do differently in 2018?